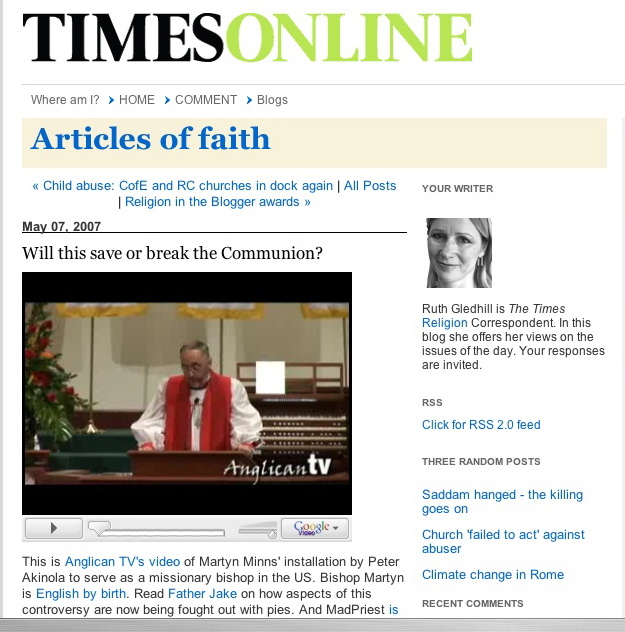 Great posting at The Times Online filed withe lots of links over at Ruth Gledhill’s excellent and always interesting blogsite at the The Times (London) here. Thanks, Ruth – while we are busy flinging and ducking pies on this side of the Atlantic (though here at the Cafe only Shrove Tuesday Pancakes are authorized for such things), it’s always good to know that there are others out there watching and taking notes. Just keep an eye on the skies for a sign of the Pie. What is this thing you refer to called a <>blogsite<>?